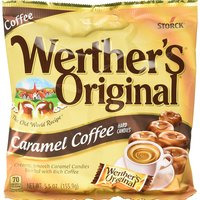 Werther's Caramel Coffee Hard Candy. FW Cafe Coffee tastes like coffee candy with a hint of caramel. The coffee flavor tastes like artificial coffee flavoring like that used in coffee candy. Like it's not even really trying to taste like actual coffee. Based on the horribleness of a lot of coffee flavors that are trying to do that, the artificiality isn't necessarily a bad thing. Even the mouthfeel is very candylike. It's not Bali’s Best coffee candy, because it's not quite that sweet and rich, and because of the hint of caramel in the finish. Just a hint, though, nowhere near as much caramel as a Werther’s Coffee Caramel hard candy. It's also not as sweet as candy, though it is sweet. FW Caramel Candy reinforces the hard candyish nature of the coffee and pushes the caramel up beyond just a little hint. Too much of it tastes like an overcooked Werther's and 2% is pushing it, but that slightly acrid burned sugar thing that just barely starts to come in at 2% fits right in with coffee. WF Smooth Cappuccino Cream tastes like a sweet, almost too sweet, thick heavy cream, yet with accurate bitter coffee top notes. It's also loaded with caramel, like a cup that's half filled with coffee and half filled with caramel-flavored coffee creamer. It gets this were it needs go as a smooth, creamy-tasting, caramel hard candy with coffee swirls and eliminates any need for added sweetener to fit the candy profile. Warning: This is a destroyer of cotton. Please don't put this in a sub-ohm tank with prebuilt coils and fuss at me when you need to change coils after 5ml. However, it's great in an RDA alongside your morning (or evening) cup of black coffee, especially if you're getting close to time to change your coils anyway. This is delicious but you are definitely right about the coil carnage. 5mls in cotton destroyed and can't taste much but burning paper (because the coils are so caked).